Failing Antibiotics have been overused and misused for flu and other viral infections that don't respond to antibiotics. They're also abused on farms to keep crowded animals from infections and to gain weight faster. Medical research has shown that Colloidal Silver promotes more rapid healing with less scar tissue even in the case of severe burns. A revolutionary nano technology based application. The major components are ultra pure, scientific grade water that has undergone extensive processing, combined with pure nano and sub-nano sized electronically produced silver spheres. Our product is environmentally isolated and filtered no less than 30 times prior to bottling, ensuring the highest possible quality with absolutely no contaminants. Our manufacturing process is superior to the systems utilized by NASA on the International Space Station, and by the Russian Space Agency aboard MIR to disinfect waste water for potability. Swish 1 teaspoon in your mouth for 30 seconds, 3 times daily. Safe to swallow (and highly recommended). Colloidal Silver is tasteless. 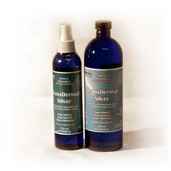 Just as antibiotic therapy kills the good and bacteria in your digestive system, so can Colloidal Silver. We strongly recommend taking Probiotics during and/or after using Colloidal Silver. If you choose to use both at the same time, take them several hours apart, so as not to interrupt the functions of each. The best... mix of colloidal and ionic, from finest and purest ingredients. Natural antibacterial, antiviral and antifungal, without side effects! Some germs are resistant to all available drugs... except for Colloidal/Ionic Silver. Washington University School of Medicine in St. Louis has shown some resistant strains of disease that cannot develop when ionic silver is introduced as they would with antibiotics. Chief technical officer of Nexxion stated, “To date, no pathogens have been able to survive contact with silver.” (Chemical & Engineering News, April 2006.). This statement was made after applying ionic-silver coating to catheters, IV needles, and other medical devices and checking for the presence of bacteria. Ionic silver is often included in dietary-supplements, medical, and industrial products. Samsung has introduced a clothes-washing machine. They claim ionic silver kills 99% of bacteria in cold water. Sharper Image has a line of slippers and pillows with ionic silver incorporated into the fabric to prevent odor-causing bacteria. Some food storage containers are now impregnated with ionic silver to deter bacterial growth, known to contribute to facilitate spoilage. Water-treatment facilities servicing hospitals use silver ions to kill bacteria. The Ionic Silver has more of an “antimicrobial” quality, rather than just an “antibacterial” quality. This distinction is important as many diseases affecting today’s humans involve “viral” pathogens, not bacteria. The medical community has no weapon designed to effectively combat viral pathogens. The standard of health care prescribed is “vaccination,” however; there is controversy as to the efficacy and safety of existing vaccines. Ionic silver is recognized as an acceptable treatment for viral conditions. European pharmacists use Ionic silver compounded solutions for treating colds and flu. The European medical desk reference guide provides pharmacists with a list of silver-ion compounds and complexes for combating these maladies. In the near future, our Ionic Silver may emerge as the recognized solution for the vast majority of viral conditions. IONIC SILVER – safe to use and kills every known yeast, mold, fungus, virus and bacteria, including candida. Yeast colonies neutralize your immune system, allowing damage inside of the cell at the DNA level. Ionic Silver is a broad-spectrum preventative agent. It destroys yeast and bacteria in as little as 15 seconds, and the latest research on cancer indicates that cancer is nothing more than an overgrowth of yeast colonies. Note: Most brands of ionic Silver are positively charged. The opening or mouth of the human cell is positively charged to repel positively charged (poison) minerals and toxins from entering the cell. Ionic Silver is broken down to its electrical component and bonded with Hydrogen ions, giving it a negative charge so that it can get inside of the cell and destroy disease causing microbes at the cellular level. NOTE: If you choose to take Baking Soda and/or Vitamin C while taking Silver, it is suggested that you separate the Silver by at least one hour from either of the other two. Topically, Ionic Silver H2O® may assist and accelerate the healing process of acne, burns, insect bites, scratches as well as a tissue-healing agent. 1 - apply to wounds, cuts, abrasions and burns to prevent and treat infection and promote healing. 2 - purify drinking water by adding 1oz. to one gallon of water,one tablespoon would do, but in this case why take the chance. 3 - apply to insect bites. 4 - apply to sunburned skin. 5 - gargle with silver to kill bacteria in mouth that can cause bad breathe. It is good for overall oral health. 7 - apply to bandaid and cover warts daily until gone. 8 - can be used to clean dentures. 9 - spray down pet kennels and bedding. 10 - use to disinfect air conditioner filters and vents. 11 - clean phones and headsets, wipe down, don't spray. 12 - spray in shoes to kill bacteria that causes odor. 13 - apply to nails for fungal problems. 14 - use to disinfect coolers. 16 - spray down garbage cans. 17 - wipe down door knobs and drawer handles. 18 - kills odors caused by bacteria. 19 - great for skin irritation, especially diaper rash! 21 - use to disinfect refrigerator, stove and any appliance where bacteria and germs can grow. 22 - clean everything in the kitchen; cutting boards, sponges, sink, and counter tops. Is very effective against e coli and Salmonella. 23 - spray scalp to deter dandruff. 24 - use anywhere germs and bacteria are present and are an issue. 25 - can be used to water plants, and can be sprayed on them to deter many mold and fungus problems. 26 - many of these applications require the use of a spray bottle (which is included).